Vocal fold paralysis refers to complete denervation (disruption) of the nerve supply to the vocal fold. The loss of the nerve supply to the vocal fold causes the vocal fold to be completely immobile. The vocal fold may be paralyzed in the midline, intermediate, or lateral position. A vocal fold paralyzed in the midline position should not cause significant vocal complaints, for glottal closure is usually complete. Unfortunately, the vocal fold is often paralyzed in the lateral position, resulting in a breathy, hoarse, voice. Because glottal closure is incomplete, the individual may also suffer from problems swallowing (aspiration) and a week cough. If you click on the figure above you will view a video laryngoscopy of an individual with a paralyzed left vocal fold. In the laryngoscopic video glottal closure is compensated but incomplete. The person’s voice was breathy and dysphonic. He also aspirated thin liquids. There is some mild bowing of the right vocal fold as well. Bilateral medialization laryngoplasty resolved his aspiration and improved the voice to normal. Figure1. Paralyzed left vocal fold in lateral position. The left vocal fold is on your right. Notice the vocal fold is foreshortened, severely bowed and appears to be on a different level than the right vocal fold. This patient had a paralyzed vocal fold from a cervical spinal fusion via an anterior cervical approach. Figure 2. 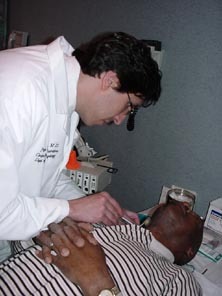 Laryngologist performing laryngeal EMG in the office. Figures 3 and 4. Endoscopic image of a person who was incorrectly diagnosed with bilateral vocal fold paralysis after a thyroidectomy. The patient underwent an emergent tracheotomy. LEMG was performed and was normal. At direct laryngoscopy a posterior scar band was identified and lysed with the CO2 laser. The posterior glottic scar was a result of having a breathing (endotracheal) tube placed at the time of surgery. The patient regained full vocal function postoperatively and the tracheotomy tube was removed. Vocal fold paresis refers to partial, or reduced neural activity of the vocal fold. The vocal fold is mobile, but movement is diminished. The degree of mobility is usually dependent upon the severity of the injury. The diagnosis of vocal fold paresis may often be difficult. The larynx attempts to compensate for the underlying deficiency. This compensation often gives the appearance of glottic hyperfunction (supraglottic squeeze). Thus, the patient is often incorrectly diagnosed with a functional, or hyperkinetic voice disorder, when in reality the patient suffers from vocal fold paresis. Please refer to the article entitled The Demise of Behavioral Voice Disorders for more information of the misdiagnosis of vocal fold paresis. Signs of vocal fold paresis include dysphonia (hoarseness), vacal fatigue, pain or discomfort with speaking, and effortful speaking. A Glottic Closure Index (GCI) greater than 2 may indicate vocal fold paresis. The most common causes of vocal fold paresis are post-viral (post-viral vagal neuropathy) and after endotracheal intubation for any number of surgical procedures (gall bladder, hernia, hysterectomy, etc…). Physical examination including strobovideolaryngoscopy may reveal abnormal laryngeal biomechanics or sluggish mobility of one or both vocal folds. Laryngeal EMG may be used to assist in the diagnosis. 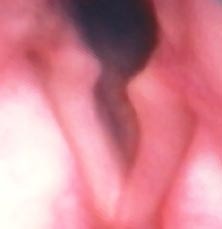 The image above is that of an individual with a right vocal fold paresis. the vocal folds are maximally adducted (closed). The right vocal fold is foreshortened. The larynx is slightly rotated. Glottal closure is incomplete with a 1-2mm gap. If you click on the image you can view the stroboscopic video. This patient was treated with an injection augmentation of the vocal folds and achieved complete glottal closure. Treatment of vocal fold paresis may be observation (tincture of time) for a paresis with a good prognosis LEMG or surgical for old injuries with little chance of recovery (poor prognosis LEMG). Please refer to the section entitled Surgical Treatment for Glottal Insufficiency for an overview of the surgical options.